Hello. I’m Jon Hodkin. I am a cyclist and a tuba player. Way back in the year 2000, I hatched the idea of combining those two passions. I think this was the first ever photo! 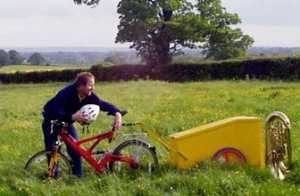 Over the years InnerTuba has pedalled and performed extensively throughout the UK. For the first time, this coming summer, I’m taking the show overseas, to Iowa USA. InnerTuba will be introduced to brand new audiences, so I’ve streamlined this website, making it short and sweet. For now, updates and additions will focus on this exciting, upcoming overseas tour …. let me come and play at your place !…. InnerTuba can usually set up and perform easily at your venue. (Lots of steps and stairs and narrow doorways and corridors can be tricky though !). 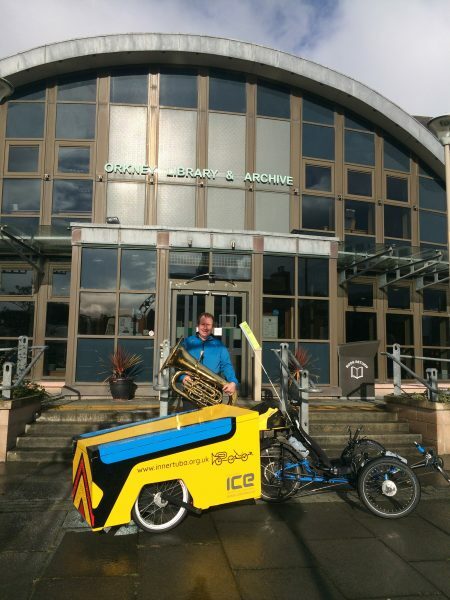 During the Iowa Tour, schools are on holiday, but I’ll pedal to and perform at your summer camp, your older people’s home, your day centre for adults with special needs, your cycling club, your hostel for homeless people, your factory – in fact anywhere that has a small road to it, InnerTuba can reach ! Preparing to play at Kirkwall Library during the September 2018 “Enterprise Music Scotland” Tour on the Orkney Islands.